Demonstrations are quite common these days in Buenos Aires. 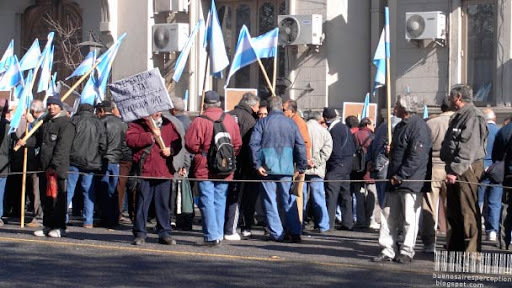 Argentineans virtually insist on their assured right of free assembly and know about the absolute necessity to demonstrate for their causes. This group of protesters is demanding the abolition of resolution 041. They claim that the implementation of this resolution ruins their basis of life. I don't know what the resolution 041 is all about; if you know what's at stake, please let me know. The possibility to voice one's opinion is being threatened in many countries so, whatever the issue here, let's support the right to demonstrate peacefully in Tehran and elsewhere. I think, as Per Stromsjo, pointed out that certain freedoms, including the right of peaceful assembly, are under attack around the world as the powers-that-be feel threatened when their stupid policies create anger and frustration. We need a few demonstrations here! Okay, I'm off my soapbox now! I admire governents that allow their citizens to express their opinions! Its ok in Spanish? Las demostraciones es lo unico que le queda a los pueblos para demostrar sus carencias, exigencias o inclinaciones politicas, como esta sucediendo en Iran. Algunas personas en Mexico tenemos la impresion que la Sra. Kirchner esta haciendo bien las cosas, no como el gobierno de nuestro pais que esta completamente alineado. Esta foto es magnifica por su espontaneidad! Saludos. I think that a lot of people rethink the value of their right to demonstrate peacefully these days. This right is an absolute necessity. What happens in Iran is terrible. Yes, it is indeed hard to figure out what their agenda is in detail. They would be doing better using the Internet and making a blog or something. If you don't know what they are standing for you are probably not going to support them. I agree demonstrations are the only thing that is left to the people. In Buenos Aires demonstrating is a very common way to express anger, political thoughts and demands. You can see them almost every day. They seem to be using colourful language. Apparently, they were chanting "“UNIDAD DE LOS TRABAJADORES Y AL QUE NO LE GUSTE, SE JODE, SE JODE”". I will leave it to someone else to translate. Thanks a lot! Indeed, the language is quite explicit. Don't we have enough laws? I know we have more than enough politicians.